Please let me introduce our single deck long coach with 51 – 53 seats. We were the first transport company in Thailand to use the long coach for tourism purpose (non-fixed route) since 2014. With this highest safety standard of coach, it suits people with big group. As well as the highest safety standard, it is more convenient to step on the coach since the stairs are not too steep, especially for elder. 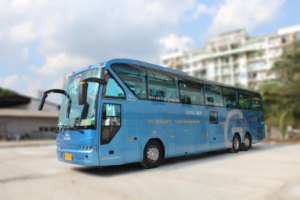 Moreover, half of our fleet for this type has a VIP & karaoke room at the back which you can use for entertainment or business meeting purposes. If you are looking for vehicles that can fit big groups up to 53 passengers, please don’t hesitate to contact us.